A big part of what makes Facebook such a powerful advertising platform, is that it has tons of data on all of its users. This allows for some pretty amazing audience targeting capabilities, which you can use to your advantage to make sure you get your message in front of exactly the right people. Retargeting works because you already know these people have some interest in your products, your services, or your content. Whether you’re running an affiliate site that revolves around longform product reviews, or you’re selling a tangible product, retargeting is a must-have strategy for your digital marketing arsenal. Ecommerce has pioneered audience retargeting, on Facebook and elsewhere. The thing is, you don’t have to be in the ecommerce space to take some cues from what works in that industry. In a recent article at AdEspresso, the authors explain how any business can come out ahead via retargeting on Facebook, no matter what you’re selling. Any business can take advantage of retargeting. Start by figuring out who you should target and setting up a plan that boosts their interest. A tool like Facebook Pixel does all the hard work for you once you’ve set up your specs. It tracks activity on your website and measures your campaign ROI. It goes further by letting business users create custom audiences. 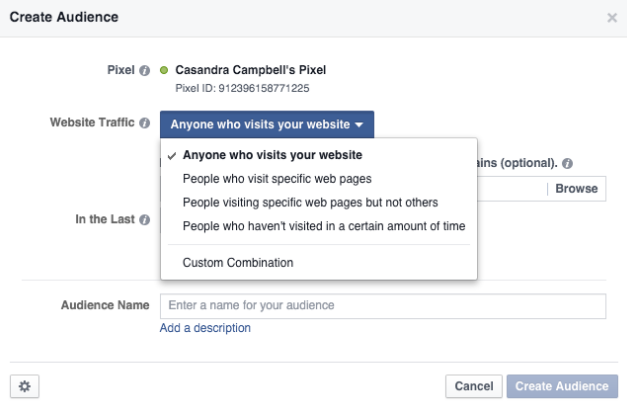 If potential customers are logged into Facebook when they visit your site, Facebook pixel tracks their actions. With this information, you can show targeted ads to specific audiences. Pixel lets you define what each of your audiences looks like so that you know who you’re talking to. Once you know who to retarget, it’s important to customize your campaigns. There’s something that piqued the initial interest of your potential customers. It’s your job to remind them of the value they saw so that they’re more willing to convert and become a customer. It’s a worthwhile exercise, but will take some trial and error until you figure out exactly what works for your service. The good thing is you’re not locked into any strategy. You have the flexibility you need to make adjustments that get potential customers to come back and buy. Build a strategy that revolves around filling in the gaps and capturing customers who didn’t respond during initial marketing campaigns. Retargeting and remarketing work together. Before you can market to potential customers again, you have to first set up requirements to determine who they are. It’s a cycle, so retarget and remarket more than once to encourage potential customers to come back and buy. You can learn more about retargeting over at AdEspresso.